Why are we passionate about post modern, post christian, churched generation Young Adults? "Americans in their twenties are significantly less likely than any other age group to attend church." 86% of the Young Adults in the evangelical church leave at age 18 and ever come back. Thisfigure sounds incredibly high to me but even if it is in actuality, only a fraction ofthat amount it still shows there is a real problem in the Church today. If churches do not "modify the approaches they use to influence the faith development" of this group, teens who grow up to be young adults will be "the least churched generation." The Young Adult Crisis Hotline and Biblical Counseling Center are helping to encourage discipleship and growth in each individuals walk with the Lord. Our personal vision of The Young Adult Crisis Hotline and Biblical Counseling Center is rapidly expanding into creative, effective and fruitful outreaches. The Young Adult Crisis Hotline and Biblical Counseling Center is a unique extension of our vision of “Impacting Young Adults World Wide.” The combination of tremendous personal discipleship, patience, divine encouragement and constantly pointing people to the Cross is producing fruit that is not only remaining but “Taking the Word to the World” as well. The purpose is now to cast our nets and fish for others. The Young Adult Crisis Hotline and Biblical Counseling Center is a unique extension of the vision of the TOPEC Foundation. The vision of the Total Personal Care Foundation is to expand to working and developing this Generation. The Young Adult Crisis Hotline and Biblical Counseling Center are therefore helping to encourage discipleship and growth in each individuals walk with the Lord. 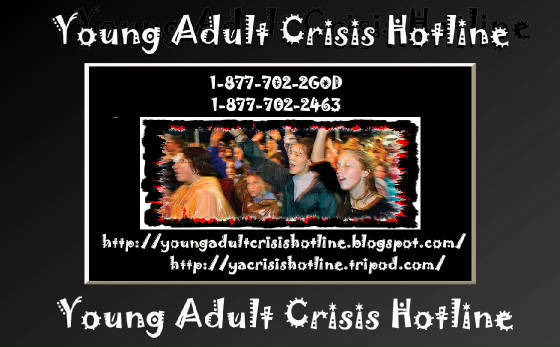 The Young Adult Crisis Hotline and Biblical Counseling Center has become a Christian Outpost that helps individuals who have life controlling problems to become responsible, productive and caring individuals through its personal development program with intensified Grace Rational Therapy. This program ministers to the spiritual, psychological and physical needs of its clients. This ministry will serve as a bridge to the local church community by preparing and training the individuals to live Christ-centered lives. It will facilitate these goals by teaching and presenting them the biblical alternative to life challenging problems by offering the biblical solution to freedom based upon “The Finished Work” of Jesus Christ and His principles.